You are currently browsing the tag archive for the ‘Campaign to Close Campsfield’ tag. I was held at Bagram detention facility before Guantanamo. I witnessed some terrible things there. If that place is closed too, we’re doing well. If it isn’t, we’ll see more of the same. 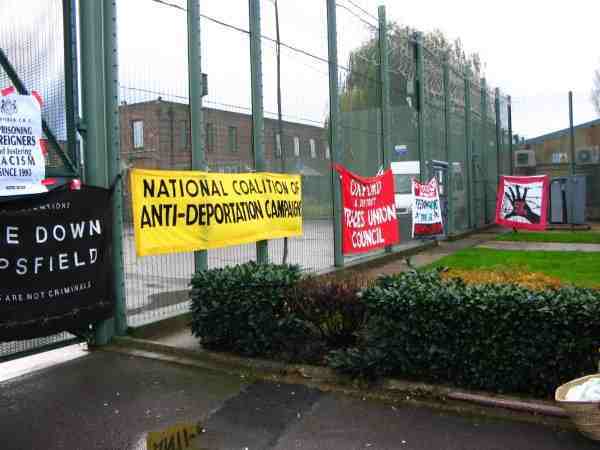 These were the words of order at the protest outside Campsfield House Immigration Removal Centre (IRC) on Saturday 29th November, the 15th anniversary of its inauguration. Activists from No Borders South Wales joined with over 100 people from London, Birmingham, Coventry, different towns in Oxfordshire, mainland Europe, Turkey, Congo and elsewhere, to stand their ground in solidarity with the detainees held beyond the endless fences, bare empty ground, barbed wire, bars and walls. We were at Campsfield to shout words of solidarity through the bitter cold air and fences. The speakers included Bill MacKeith from the Campaign to Close Campsfield, Romain Ngouabeu from National Coalition of Anti-Deportation Campaigns (NCADC), local MP Evan Harris as well as former detainees and partners of detainees. The atmosphere was one of enthusiasm, warmed by steaming soup, and energized by lots of music and bright eyed children running around with ‘Stop Detention’ signs. Particularly heart-breaking was turning our backs and leaving, to the sound of the detainees inside, asking us not to go, asking when we would be back, why we wouldn’t just take the fence down. Why won’t we? After the protest a meeting was held by Barbwire Britian (network to end migrant detention), in a nearby hall, where Steve Symonds, Legal Officer of the Immigration Law Practitioners’ Association (ILPA), gave a special briefing on the Borders, Immigration and Citizenship Bill. Over the past 15 years, Campsfield has been the topic and stage of much criticism, from activists as well as ‘authority’ figures, various violent incidents (aka ‘disturbances’), hunger strikes and a suicide. It opened as an immigration detention centre in 1993; having been originally built as a military barrack and subsequently serving as a hospital and a detention centre for young people it now holds 216 male inmates indefinitely without trial or charge, simply for exercise their right under the Geneva Convention to claim asylum in Britain – daring to live in a different place to where they were born. “there is much circumstantial evidence that indefinite detention can lead to a deterioration in either mental or physical health or both ” . In August this year, 13 Iraqi detainees went on a hunger strike, later to be joined by 50 others of various different nationalities. Earlier, in June, fires were started in protest inside the centre and a team of 50 prison officers, a fire engine, a helicopter and dog handlers called on to ‘restore order and ensure no one escaped’. Let us recall that seeking asylum is a human right and that none of these incarcerated people are criminals. 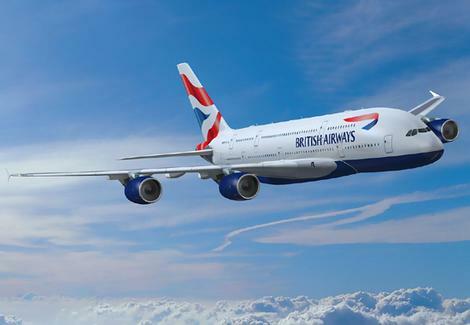 In the early hours of Monday 6 October, Jean Pierre Gueutchue was deported on a British Airways flight back to Cameroon. He had been detained in Campsfield Detention Prison, Oxfordshire, for some time and was originally set to be deported on July 21, 2008 on the infamous Kenyan Airways Flight 101 but this did not take place. While no other removal directions were give, Jean Pierre was not release and spent the last four months of his time in the UK incarcerated in Campsfield. Jean Pierre fled Cameroon and arrived in the UK in 2003, where he made a claim for asylum. He had been living in Cardiff before being detained, where he had established strong links with his community and made many enduring friendships. He was a much loved figure in the asylum seeking and refugee community in Cardiff and was a prominent member of Refugee Voice Wales. He had worked as a volunteer at the local British Red Cross for a number of years. He will be sorely missed by all who knew him. 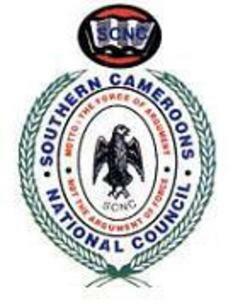 In Cameroon Jean Pierre was imprisoned and tortured for his political activity with the Southern Cameroon National Council (SCNC), a secessionist movement that has been declared illegal in Cameroon. In prison he was subjected to torture including being kicked, whipped and a practice called ‘falaka‘, which is a where a victim’s legs are tied together and soles of the feet are beaten with the flat surface of a machete. This is despite the fact that the report stated that it would be very rare to see so many scares and that it is unlikely that they would have been caused by other means. As well as the physical and mental scares that had been caused by his torture, it is highly likely that he also contracted Hepatitis C during this time. Prior to his being detained Jean Pierre had been receiving medical treatment at Cardiff’s University Hospital of Wales for this, who had said has stated that it is vital that Jean Pierre’s health is reviewed in relation to his Hepatitis C treatment. This review was due to take place on 16 October, just 10 days after he was deported! Jean Pierre’s deportation was also carried out even though Cardiff MP, Julie Morgan had taken up his case. On 2 October she had made a request for an urgent meeting with the Immigration Minister Liam Byrne, and in all probability it was this request that triggered the decision to quickly carry out the deportation over the weekend. At lunchtime, on Sunday 5 October Jean Pierre was given his removal directions by Campsfield’s manager. Clearly we’re having an impact and the tactic of phoning, faxing and emailing airline companies involved in deportations, that we and other campaigns advocate, is seen as so effective that the Home Office had to go to the lengths of bypassing its own rules in order to make sure that the deportation was carried out. Jean Pierre was then removed from Campsfield in the middle of the night and taken to the airport by 3 guards, one driver and 2 police officers. The police remained with him until the plane was ready to leave. The same procedure happened in France with 2 police officers boarding the plane. When he arrived back in Cameroon he was met by more police who handcuffed him and put him in a cell. Luckily, Jean Pierre had managed to contact a friend who was able to bring money so that he could bribe the chief of police to release him into the custody of another police officer so he could leave the cell. He was told that he would be contacted when he was needed again. The next day he was arrested and questioned again, and again, had to bride his way out. He was told in no uncertain terms that his case was not closed. Jean Pierre’s life is clearly very unsafe and we will do all that we can to continue to offer him solidarity. The situation that he now faces is not unique however. It is one amongst many that highlights the brutality of immigration controls. Everyday hundreds of people are deported from the UK back to situations they have risked their lives to escape. With the European migration regime intensifying all the time, we need, now more than ever, to stand in solidarity with all those living precarious lives because of capitalism and the state and to fight for a world free from migration controls. For an end to the hierarchies and selective inclusion that the European regime of migration management creates and for a world of equality and freedom for all. Migrants imprisoned at Campsfield House detention prison are being paid slave wages it has been discovered. GEO, the multinational corporation that runs Campsfield under contract from the Home Office, not content with making huge sums of taxpayers money to imprison people whose only crime is to have come to the UK in search of a better life, is currently paying migrants £5 for six hours of work – either in the kitchen or cleaning. In a bid to extract as much profit as possible from the misery caused by the migration regime, GEO (since taking over the running of Campsfield) has cut back on both staffing levels as well educational, recreational and other provisions at the centre. The Home Office says that migrants imprisoned in detention centres are exempt from the minimum wage and are not forced to work. But those migrants that we have spoken to have said that there is so little to do in Campsfield that working gives them something to do and takes their minds of the uncertainty of what possibly lies ahead. This in no way excuses paying them the unbelievably measly sum of 83p an hour. Especially as refreshments and food that can be bought at Campsfield cost the same as that in the outside world. We maintain our position that Campsfield is a shameful operation and should be closed. As long as it is open, jobs should be properly paid and be done by trained staff. For detainees there should be adequate recreational, educational and other provision… Detainees should receive an adequate financial allowance and not be obliged to act as slave labour for a multinational that makes big profits out of an operation that causes detainees enormous stress, uncertainty, general misery and often mental illness. One of the people currently imprisoned in Campsfield is Jean Pierre Gueutchue a victim of torture from Cameroon. Jean Pierre had been living in Cardiff until he was detained when attending his weekly signing at the UK Border Agency. He was due to be deported on 21 July but thankfully this did not take place. Despite having had no new removal directions since this time Jean Pierre continues to be imprisoned in Campsfield. We are working with members of the Campaign to Close Campsfield to get him released back to Cardiff where he belongs. See Jean Pierre’s campaign page for ways that you can support his fight to stay.